Karuta Roromiya. Maybe she walks around in her own world, but so what? Inu X Boku SS (The Dog and I) is a slow moving series, but I really like the direction it is headed. The past several episodes have been introducing characters, so there really hasn’t been much progress in the central narrative, but that story (about two broken people who are healed by coming together) is such a nice one that I have been satisfied to watch what happens. This time, episode 6, the series took a different perspective on this central theme. One of the main characters (Soushi Miketsukami) was almost entirely absent, and instead the other (Ririchiyo Shirakiin) was mostly an observer of another pairing that is full of awkwardness, but is essential to the participants. Roromiya is the class freak, who is constantly doing things that make the other kids think she is "weird". While Ririchiyo keeps her nose to the grindstone, Roromiya is constantly doing something out of the ordinary. The other kids talk openly about her as a freak, and this causes Banri Watanuki to defend her, including getting into fights. 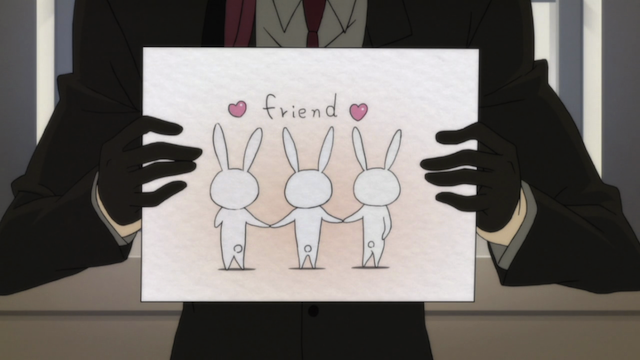 Roromiya is weird, and Watanuki is incapable of dealing with his own feelings openly, nevertheless the two have developed a deep friendship, and look out for one another. 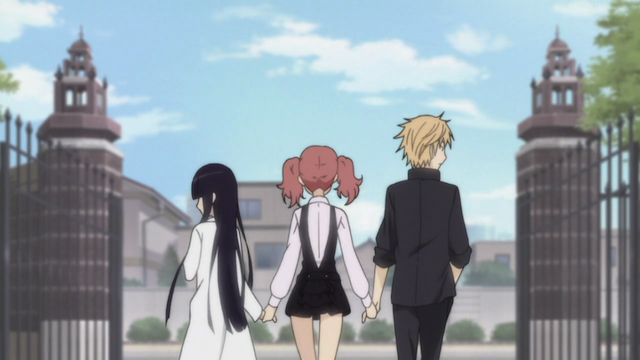 By observing Roromiya and Watanuki’s flawed, but essential relationship, Ririchiyo can see the importance of connecting with other people, and also that it is possible to connect with others, even when you don’t quite know how. People need each other to get along in this world. Ririchiyo Shirakiin thinks cooking is serious business. I’m glad she finally figured out what was causing her heart palpitations (duh! ), and I LOVED her outburst in the lab. That actually made me laugh out loud. There were a lot of funny and sweet moments in this episode. Ririchiyo’s detached, by-the-book analysis of her heart racing was just like her approach to cooking; she is completely over-thinking it. She needs to start “seeing the possibilities clearly”. 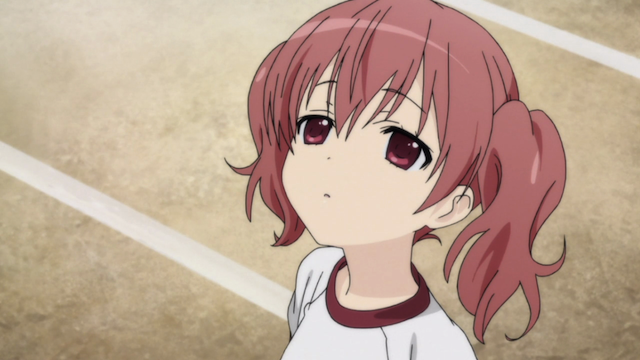 Karuta was adorable and my personal favorite of the ‘supporting cast’. But then, I have a massive soft spot for Cloudcuckoolanders anyway. Karuta really won me over in this episode. I’d already liked her, but this cemented her a favorite. 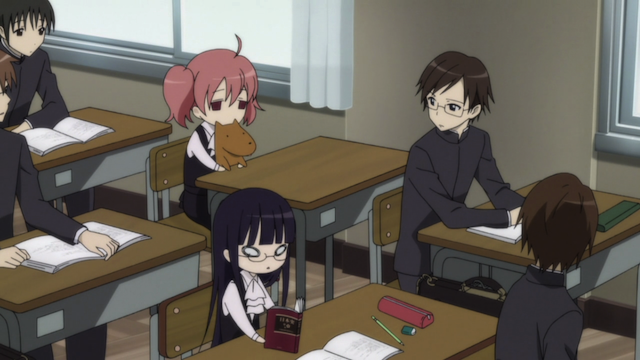 I like the completely relaxed relationship she has with Watanuki too. She acts like the two of them together is so natural and inevitable that there’s no reason to make a big showy production of it. I imagine that if asked if they’re together, she’d respond in much the same tone as she would if asked if the sky is blue. I have to admit to really liking her ED, too. I agree with you. The way things were handled here was very clever. On the one hand, Karuta seemed to be out of it, but she was actually taking in MORE information than the people around her. It was the same way with, for example, the cat in the tree. Nobody else noticed, but everyone thinks she is spacey. 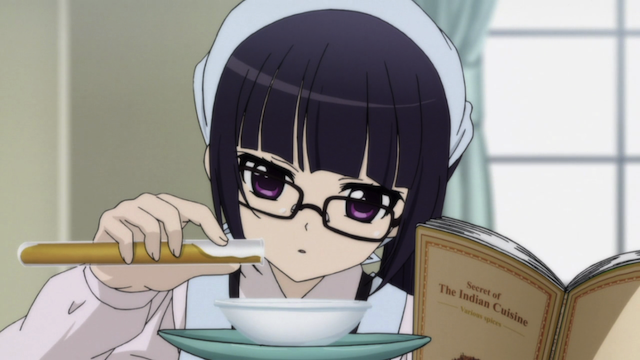 And, yes, her relationship with Watanuki is great. He obviously has a hard time dealing with his own feelings, but she is very natural in the way she acts with other people, and that is a good thing for Watanuki, because she really goes the extra distance in that relationship, even though he is so obviously smitten. I’m not really a big fan of this series, but particularly this episode caused a lot of moe HNNNG among my fellow otakus, and so I watched it just to check it, and alas! So cute! Yes, that ED was kami (divine)! The patisserie scene was really cute! Hanazawa Kana’s rap was so cute. That worldview, and that Wa-tanuki, a raccoon dog, ahh, good combination! It was a particularly good episode. Honestly it isn’t the most focussed series — I would like to see them tighten up a bit, but I don’t know what pieces are going to be necessary for the story later. I think this episode draws a very stark contrast between Karuta and Ririchiyo. Both are socially awkward and not really popular with the class. Yet Ririchiyo is very self-conscious about her social clumsiness while Karuta just plain doesn’t care. She shows another way to approach this issue–not by improving interaction and communication skills as Ririchiyo tries to do, but by just doing her own thing and letting social things happen naturally. I like her way! That’s a great point. I find Ririchiyo’s self-consciousness understandable, because I’ve had that experience of being way too much in my head, and have been socially awkward, but what I really like about her as a character is that she wants to change.